GIGA GRANADA HILLS: What Should The New High School Be Named? What Should The New High School Be Named? We've got a new High School going in, and Brad Smith of the GHSNC just pointed out that it doesn't have a name yet. So I think we should band together and come up with one, yes? The school's working title is Valley Region High School 4, but obviously that won't do. Interesting fact: the school just so happens to be on the former site of my birthplace, Granada Hills Community Hospital. And of course, Giga High would be an extraordinarily rad name for a school, but we all know that when faced with a plurality of choices, LAUSD never goes with the raddest one. Badass Brad favors naming the school after John W. Finn, a native Angeleno and Medal of Honor recipient from WW II (the only one of 15 from Pearl Harbor for combat, as opposed to rescue work) who died this year. The honorable contributions of Mr. Finn aside, my preferred approach would be a name with a more direct connection to our region and to Granada Hills' history. Valerie Bertinelli High? No, she went to Granada. Cheech Marin High? No, too redundant. Joseph Eichler was a social visionary and commissioned designs primarily for middle-class Americans. One of his stated aims was to construct inclusive and diverse planned communities, ideally featuring integrated parks and community centers. Eichler, unlike most builders at the time, established a non-discrimination policy and offered homes for sale to anyone of any religion or race. In 1958, he resigned from the National Association of Home Builders when they refused to support a non-discrimination policy. Yet since the school building itself, I'm assuming, will not be an architectural heir to Eichler, naming the school after the visionary architect would take on a certain oddball irony. That leaves just one obvious choice: the school must be named Bo Diddley High School. Mister Diddley lived in Granada Hills circa 1968-1971, and his contribution to the world of music, especially in the early fusion of blues and rock are unmatched. Naming the school after him would signify recognition of our region's history as well as the importance of arts in education. Name the new Granada Hills school Bo Diddley High! Alas Eichler was not an architect. He was a builder with great taste in architects. 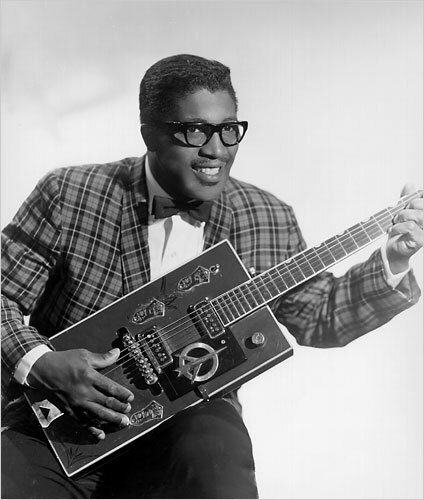 Bo Diddley High, though: c'mon people, you know it's the right thing to do ! I vote for ANYTHING but Granada Hills East as I hope they don't get control of that school. Write that to Mr. Cortines! I love Brad Smith's suggestion. Finn High School would be a great choice. Linda - Thanks for putting this up. More seriously: Kim, if you have a chance, please e-mail me. I'm curious about your point of view regarding (I think) the GH Charter HS leadership. The name needs to be bold and something to be proud of; not a name that will bring constant embarrassment and ridicule: Diddlers High - a bunch of blooming molesters? Giga High - really? Think it through folks - it's bad enough many of you gave your kids' names nobody can spell or pronounce.